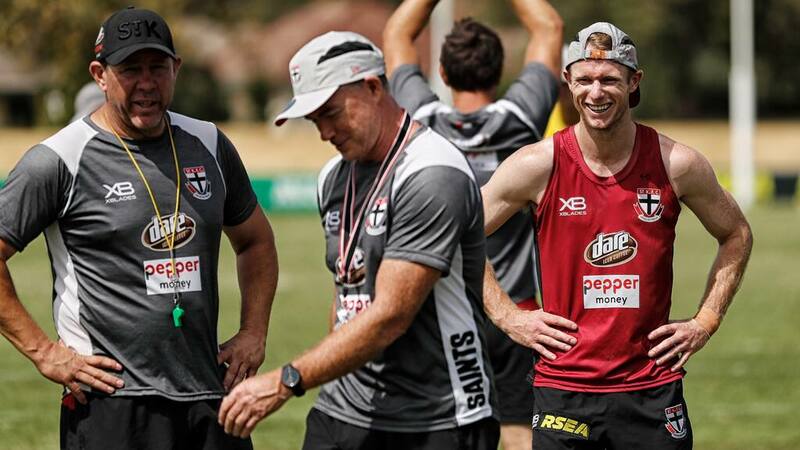 MATURE-AGE speedster Nick Hind has bolted into calculations for a round one debut at St Kilda as coach Alan Richardson prepares for added flexibility in 2019. Drafted out of Essendon's VFL side, the 24-year-old was one of four players plucked from state leagues in November as part of a targeted draft strategy designed to have immediate impact. One of the standouts on the track in a skills session on Wednesday led by new assistant Brett Ratten, Hind enjoyed an extended chat with Richardson and Ratten after catching their eye. "There was a bit of play that we really liked, he brought us back inside from a rebound, that's what that was about," Richardson told AFL.com.au as part of a day of exclusive behind-the-scenes access. "That's what we recruited him for, a bit of speed and penetration." While robust discussions were held between the list management committee to decide on the mature-age path, it was the success of a triple-premiership Hawk that carried weight. New St Kilda list boss James Gallagher was Norwood's captain when 23-year-old teammate Paul Puopolo landed at Hawthorn at the end of 2010. Transformed from a back pocket to dangerous small forward who has since played 168 games in eight seasons, Puopolo's story impacted thinking in November. Gallagher's pitch on Puopolo, among others, led the Saints to calling out Hind, South Fremantle's Matthew Parker (22) and North Adelaide pair Robbie Young (23) and Callum Wilkie (22). While also falling short in the race to snare Dylan Shiel, Richardson believes the next wave of St Kilda midfielders could be unearthed internally due to the arrival of readymade talent. "What it's given us are some tools and some choice, potentially," Richardson said. "(We say) OK, you blokes (Parker and Young), you're probably going to play forward initially, that might allow (Jade) Gresham and (Jack) Billings to play more midfield. "While we didn't pick up the elite midfielder (Shiel), we might bring up our own. "Adding Dan Hannebery is going to be a big asset with his experience and he'll be able to show the way for some of these guys. "Down back it might potentially do the same, we might have a look at (Jimmy) Webster on the wing because of what Hind might do through there. "Because they're at that age and they've already played, been through three or four pre-seasons, it's just giving us some choice and flexibility." Parker and Young joined recruit Dean Kent, boom draftee Max King, Tim Membrey, Josh Bruce, Paddy McCartin and Jack Lonie in Ratten's forward line meeting on Wednesday afternoon. Watching vision of West Coast's forward structure from the 2018 AFL Grand Final, Ratten then relayed clips from their own sessions this summer. Gresham and Billings were notable absentees, instead moving to the midfield meeting run by new assistant Brendon Lade and Adam Skrobalak, who has been elevated to full-time. Out of contract at season's end, Gresham and Billings will be first on the Saints' list of priorities at the negotiation table. AFL.com.au will detail other aspects from behind-the-scenes access at Moorabbin in the coming days. This will include team meetings, different player roles for 2019, Richardson's fresh approach, the handling of new rules, Dan Hannebery's influence on teammates and Billy Slater's impact.